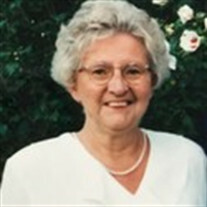 Obituary for Nellie T Kloosterman | Langeland Family Funeral Homes, Inc.
Nellie 86, went to be with her Lord and Savior peacefully at home surrounded by her loving family. Nellie graduated from Kalamazoo Christian High in 1949. She went on to work at the Upjohn Company, South Christian Grade School and Jacobson's department store. She also managed Rainbow Valley Miniature golf, the backyard family business. Nellie was the first of eight children born to John and Hattie Triezenberg. Her siblings include Eleanor (Joe) DeKoekkoek of Kalamazoo, Harold (Phyllis) Triezenberg of Kalamazoo, Frank (Judy) Triezenberg of Wyoming, Patti (Peter) Blok of Kalamazoo. Nellie was preceded in death by her sisters Lois (Fred) Gunnink, Elaine Triezenberg and her brother John (Janice) Triezenberg. Nellie is survived by her husband of 56 years John. Children include Jonathan (Chris) of Vicksburg, Jeffrey (Katherine) of Hudsonville, Annmarie (Tom) Kiemel of Colorado Springs and Charlene (Larry) White of Scotts. Grandchildren include Dylan and Casey Kloosterman, Analise, Grace and Brynn Kloosterman, Nicholas, Noah and Thomas Kiemel and James White. Nellie's interests included knitting hats, mittens, baby blankets and afghans for family, friends and various organizations. She volunteered at church and school events and was involved in catering at the Kalamazoo Christian Schools. She was a lifelong Cubs fan and enjoyed watching them win the World Series. Nellie was a member of Grace Christian Reformed Church. She loved being a Grandma and enjoyed spending time with her nine Grandchildren. She attended many sporting events and after school activities. Nellie never missed sending out cards and notes for birthdays, anniversaries or other special days. Every Saturday morning she could be found enjoying breakfast with her family. It was the highlight of her week. Nellie was a two time breast cancer survivor. Services and a celebration of her life will be held on Friday, April 20th at Grace Christian Reformed Church, 1724 Whites Rd. Visitation will be from 4:00 p.m. - 5:00 p.m., service will start at 5:00 p.m. with a reception to follow. Private interment will be at Ft. Custer National Cemetery. In lieu of flowers, please send donations to Grace Christian Reformed Church, Kalamazoo Christian Schools or Hospice of Southwest Michigan.